I paid a visit to the Kirkwall Chantry recently…somewhat disappointed by the lack of men in armour wielding broadswords but it was a really beautiful building. It did however get me thinking about different game worlds and how they reflect on the world around us. There are some similarities between Kirkwall the real place and Kirkwall the virtual one, both are located by the sea and both have religious buildings as a focal point but there is a distinct lack of chains (at least in the areas we visited) in the Scottish version. Looking at art work like this, (one of the loading screens from Dragon Age II). It doesn’t require a huge imaginative leap to contemplate that perhaps the designers also had the “real” Kirkwall in mind with it’s Cathedral named for Magnus Erlendsson (St Magnus) when they decided to call the “City of Chains”, Kirkwall. Here we can clearly see a Gnome leaving a Dwarfish dwelling (or not). I know it’s been a long time since I posted last and if I’m being honest, I have no idea if I’m back. 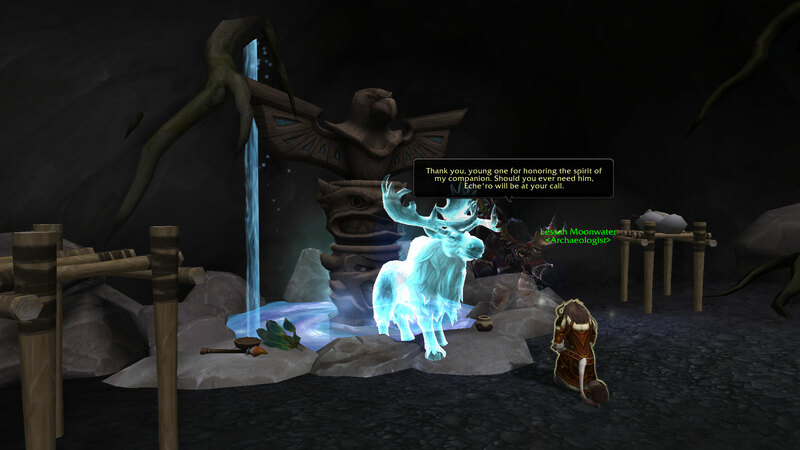 It turns out that I was “not prepared” for Post-natal depression, in fact I imagine it was the real world equivalent of fighting C’thun, Ragnaros versions 1 & 2, the Lich King and 4 Horde raids all at the same time whilst in the Suppression rooms from Blackwing Lair. In an ideal world, I would like to start posting at least once a fortnight (folder full of drafts, half written stories and I’m still finishing the last Dragon Age) and intend on returning to the game at some point prior to the next expansion going live. In the real world…who knows. I knew I’d seen that mermaid before, yep, this one. It’s been bugging me ever since that post, dancing just out of reach, twisting away every time I reached for it. Then with blinding clarity it came to me when I was reading your last post on muses, those most fickle mistresses. 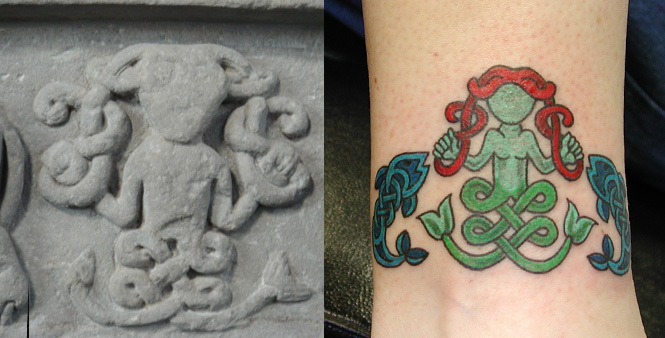 It wasn’t the tattoo I recognized but the stone carving along side it. My in-laws live around eight minutes away from the museum which houses the original. 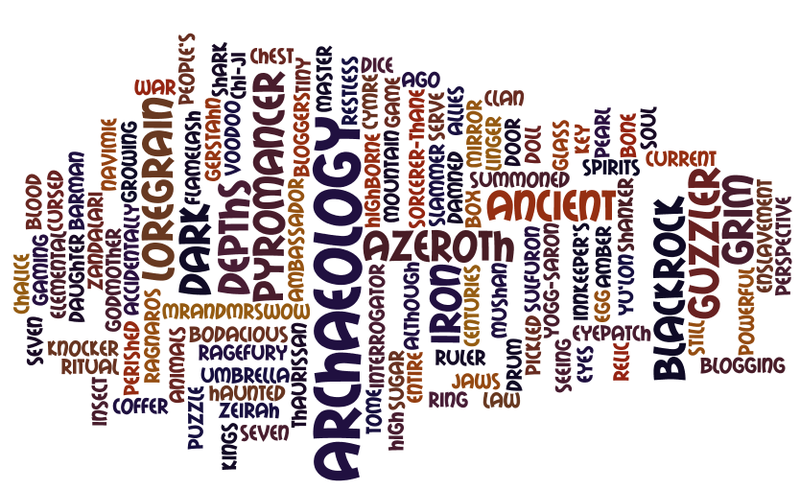 Sometimes the world seems so tiny, it makes Azeroth look huge. Finding a Melusine on a Pictish stone stood out, although not enough clearly. Coupled with the fact that the comb and the mirror are common symbols on these stones, it makes you wonder if they knew something we didn’t. I’m going to blame Navi and Matty for this post. To start, I’m not really romantic in the slightest. I hate chick lit and chick flicks with a passion I normally reserve for brussel sprouts and bad drivers. I got my worst ever mark in English Literature for an essay on Romeo and Juliet because I couldn’t imagine anything crazier than killing yourself for love. Killing your parents for denying it made far more sense to my teenage brain (yes, I might have had a few issues back then). It was a B and I was grumpy for weeks and then to add insult to injury I had to read the part of Juliet as we acted out the play in class. Which brings me to Pyramus and Thisbe, the lovers who inspired Shakespeare’s Romeo and Juliet and their Azerothian equivalents Pyramond and Theleste. As much as I’d love to re-write lore (and to be honest, my version was better :p), I’m not Blizzard so to make amends for my essay back then (and all the stony looks I directed at my teacher), here is my take on the achievement <A Tragedy in Three Acts> via Ovid, Shakespeare and Tennessee Williams. Tennessee Williams, The Glass Menagerie. Archaeology is all about piecing together a story via the bits and pieces we dig up and this achievement is no different. All we know about these “star-crossed lovers” is what they left behind and should we get the context wrong, then we’re left with nothing more than “illusion that has the appearance of truth”. I think there are two possible solutions to this puzzle but as with every mystery, figuring out the order of the clues is important. So what do we know? We have the two introductory pieces, the ones which set the stage and pave the way for what comes after. A piece belonging to each of the protagonists. For Theleste that’s a malachite and silver hair pin. There is no clue who gave her this, it could have been Pyramond or it could have been her parents or a whole host of other characters lost in the mists of time. For Pyramond, it’s a cloak clasp. This clasp is fashioned of lacquered wood carved to resemble stag antlers. On the reverse is engraved the name ‘Pyramond’ in Darnassian. From that we can deduce that either Pyramond’s family name had something to do with a stag, perhaps he was another doomed relative of poor Fandral. Alternatively perhaps the clasp was a gift from his parents when he started training to become a Druid. These items have to come first because they’re the only two without emotion invested in them. Every story needs a beginning and these are clearly ours. So the scene is set, the characters introduced but where do we go from here. There are a couple of possible steps depending on how we read the story. A relationship has to be established between them, which leads towards the delicate music box. Now as I’ve already mentioned, I’m no expert in romance but I do have a music box or two. One contains a slightly dejected looking Ballerina and the other contains two lovers waltzing together for all eternity. One you give a child or a friend, the other you give the object of your affections. So what’s in Theleste’s music box? An Elf dancing with a nightsaber… now that sounds more humorous than anything else. Is that really something you give the love of your life? Unless they’re a nightsaber I’m erring towards no. Then there is the inscription, “dearest”. That’s not the most expressive or emotionally driven language. It is however perhaps something that someone else would write on your behalf. Could Theleste be a suitable girl chosen by Pyramond’s parents, one he feels no real affection for and is just going through the motions. 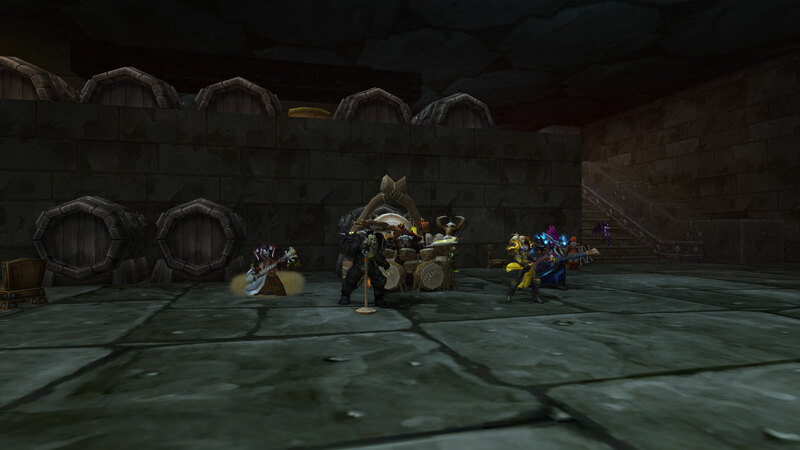 On the other hand, we know that nightsabers are close to revered in Night Elf society. 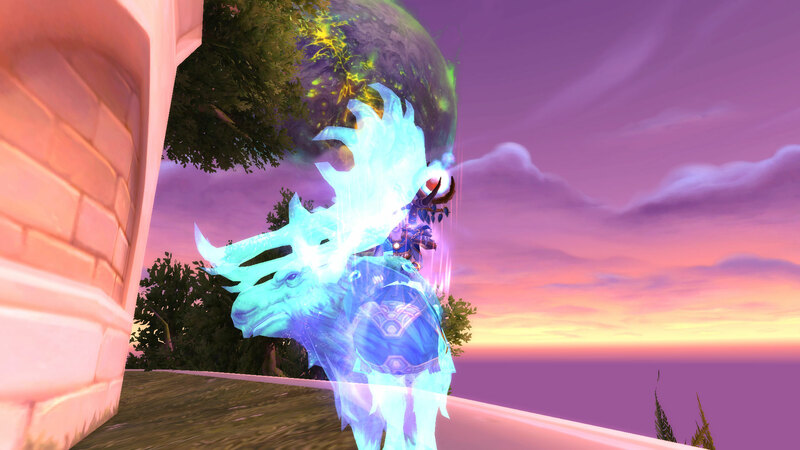 They function as both pets and mounts so perhaps Theleste had a nightsaber she was fond of and that’s why Pyramond chose this particular model. Of course, he might just have been as lousy a gift buyer as my father who has almost been divorced many many times on Christmas day for his “interesting” choice of presents for my mother. In the original story as told by Ovid, it’s a lioness who is the cataclysm for our lover’s deaths so perhaps the nightsaber is a play on that. But a lioness fresh from the kill, her jaws foaming, smeared with the blood of cattle, came to slake her thirst at the nearby spring. It could have been his mistake in having the name engraved that led to their discovery and inevitable doom. So it’s here things start to get interesting. Once the relationship is established, we move on to the first point of conflict. Now the obvious conclusion is that Theleste is the “tavern wench” but does the hairpin point at someone far below his station? The flavour text indicates a “precious” stone and this clearly expensive scroll case is made of silver too so would the hair pin belong to a girl who waits tables in a tavern? Possibly because we don’t know who gave her the pin, it could have easily been one of the tavern’s richer customers, possibly even Pyramond’s dad. In my experience when people say “Your mother/father and I forbid it”, it’s usually one parent speaking for both and trying to give their words extra authority by adding in the silent partner. This leads us to two possible conclusions. Either way Theleste is a victim in all of this but she could be either the tavern wench his parents were so dismissive of or she’s the woman he’s supposed to marry. She’s Paris to Pyramond’s Juliet. Remarkably, you managed to find an entire menagerie of these elven glass animals in their original storage container. While some of the animals have understandably suffered cracks and chips, it is clear that the head of the stag has been deliberately severed. The initial ‘T’ is carved on the bottom of the chest. Here we deviate slightly from the traditional story of thwarted love as shown by Ovid and Shakespeare. It’s clear that this item is a reference to The Glass Menagerie by Tennessee Williams. So if the stag represents Pyramond just like the unicorn represents Laura in the play what does that tell us? Well if Theleste is the tavern wench, then I imagine that perhaps Pyramond, who had finally given in to his parents demands went to see her one last time. To tell her that it was over, had to be over and just like Laura and Jim, just like the Elf and the Nightsaber, they danced to the music box. Somehow in the process, the stag got knocked over and lost his head. It strikes against the shelf of Laura’s glass collection, and there is a tinkle of shattering glass. Laura cries out as if wounded. However accidental damage doesn’t really fit in with “deliberately severed” so who broke it and why? Did Theleste wait until he was gone, running home to his parents and to the life he was meant to have from birth before carefully separating the head from the body? Did Pyramond in a fit of frustration as he realised that he wasn’t quite the man he wanted to be break it himself? Either are possible. In the original play, once the unicorn loses it’s horn, Laura becomes normal, nothing special, “Now it’s just like the other horses” so how could that translate into this story? Well since it’s Jim who breaks the unicorn which stands for Laura, perhaps it’s Theleste who ruins the stag because she can’t quite bring herself to hurt the man it represents. According to Ovid, Pyramus was meant to be very attractive so perhaps destroying the head was her way of ruining the face that had brought her nothing but misery. The fantasy of their happy life together was over, reality had once again managed to intrude. Finally we come to the end piece, a cracked crystal vase. I found the choice of words here interesting. At first I thought it was cracked from it’s years in the ground waiting for us to come along and dig it up but none of the other items indicate wear and tear. Their buried years haven’t effected them, the hair pin isn’t tarnished, the cloak clasp isn’t chipped. Which suggests the crack happened before the vial got lost in the dirt and the dust. decided that he could after all live without Theleste cracked it as he disposed of it. Separating illusion from truth and truth from illusion is impossible, unless Blizzard decide to write their own short story concerning the “real” fate of these lovers, all we’re left with are fragments of illusion filled in by our own experiences. The romantics amongst us, I’m sure will have these two entwined in death as in life, echoing Larkin’s words. To the cynics this story probably has a very different ending. Pyramond never seeing that last letter from his love or perhaps choosing life over death. There are after all plenty of other fish in the sea. Another possible scenario and one I have have to admit appeals to me would see a vengeful and abandoned Theleste seeking revenge. Without bodies we can’t even be sure that either of them died of anything, let alone spider venom. A note and poison doesn’t prove anything so perhaps she sent the poison hoping to play on his guilt for abandoning her. Thinking that perhaps that last vestige of love he had for her would push him into drinking the venom. In the end we’ll never know the truth but I like to think that doesn’t matter. At the risk of sounding like a certain British high street bank, it’s the journey not the destination which is important. Pyramond and Theleste regardless of what happened to them have proved food for thought, have been discussed and have inspired people. I spent last night re-reading Ovid, Shakespeare and Tennessee Williams because of them and that’s pretty good going for two characters who are barely a footnote in a game like WoW. I wish people who are so dismissive of computer games would see them properly rather than just “through a glass, darkly“.